Lille (Coulommiers), 7 oz. Bebe - From the northern reaches of France comes the origin of our Coulommiers-style cheese and thicker ancestor to Brie, and the name itself, Lille©. Handmade in small batches, each wheel is a slightly different weight. Aged in its own special room, and lovingly turned regularly, the delicate rind develops evenly with a white downy bloom. 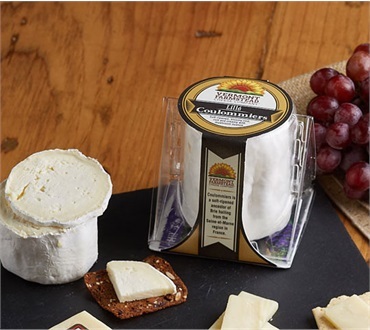 This decadently sumptuous soft-ripened cheese has a supple paste core enveloped by a rich creamy body and reveals a subtle mushroom nuance with notes of nut and butter. The rind gives a nice salty bite versus the delicate interior. Vermont Farmstead Cheese Company began as a community effort to preserve a picturesque 18-acre dairy farm in South Woodstock, Vt in 2009. Passionate residents raised money to purchase the land, buildings and equipment in hopes that it would remain a dairy farm. With the generous contributions and tireless efforts of an entire community,our dream was realized and Vermont Farmstead became the first community-owned artisan cheese and dairy facility in the state. In June 2011, we produced our first cheese, and five months later, after refining our product, we brought it to the public. In October 2012, VFCC introduced a new cheese production facility approximately 20 miles from the farm at the Artisans Park in Windsor, Vt. In addition to our facility, Artisans Park is home to 8 unique attractions including a Harpoon brewery, Silo distillery, a sculpture garden, a river outfitter, and Simon Pearce glassblowing factory and is well worth a visit. The warmth of cumin seeds in Vermont Leyden is featured in this impressive appetizer. Recipe courtesy of Bob Titterton, author of The Vermont Home Cookbook. Yield: 2 dozen. Slice the eggplant in pieces 2 to 3 inches across. Smaller eggplants can be cut on a bias. Rub a sheet pan with olive oil and place in a preheated oven for 3 minutes. Remove from the oven and place the eggplant in a single layer on the sheet pan. Return to the oven and cook for 3 minutes. Turn the slices over and cook for a further 3 minutes, remove from the oven, sprinkle with salt, and cool to room temperature on the sheet pan before proceeding. Place the chopped pepper in a food processor or blender, and puree. Combine pureed pepper, lemon juice and sugar in a small saucepan. Bring to a boil, and then reduce heat to medium-low. Cook until reduced by half and the mixture is syrupy. When cool the jam should be spreadable. If it is too thick add a few drops of water to achieve the correct consistency. Place a leaf of spinach on a slice of eggplant. Spread with ÃƒÆ’Ã†â€™Ãƒâ€ Ã¢â‚¬â„¢ÃƒÆ’Ã‚Â¢ÃƒÂ¢Ã¢â‚¬Å¡Ã‚Â¬Ãƒâ€¦Ã‚Â¡ÃƒÆ’Ã†â€™ÃƒÂ¢Ã¢â€šÂ¬Ã…Â¡ÃƒÆ’Ã¢â‚¬Å¡Ãƒâ€šÃ‚Â½ teaspoon of red pepper jam, and place a stick of Leyden on each. Roll the eggplant around the cheese and place seam side down on a serving platter. Secure each with a toothpick if you like.